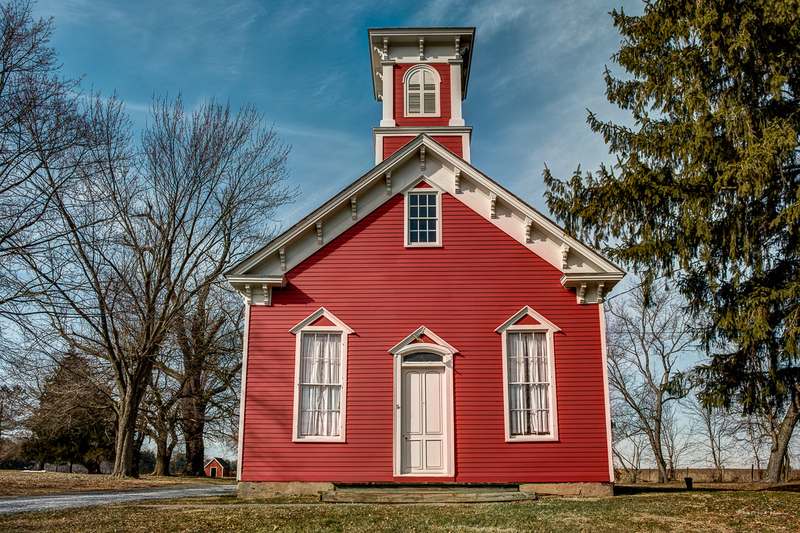 Constructed in 1873, the South Branch School House in Branchburg Township is a one-room building in the Victorian-Italianate style of architecture. From 1873 to 1950 it educated children in grades 1 through 8. In 1848, Henry Barnard published School Architecture, which offered designs and ideas for model schoolhouses. Following his advice, schools were built with rectangular plans on raised foundations, with the gable end would serving as the front. 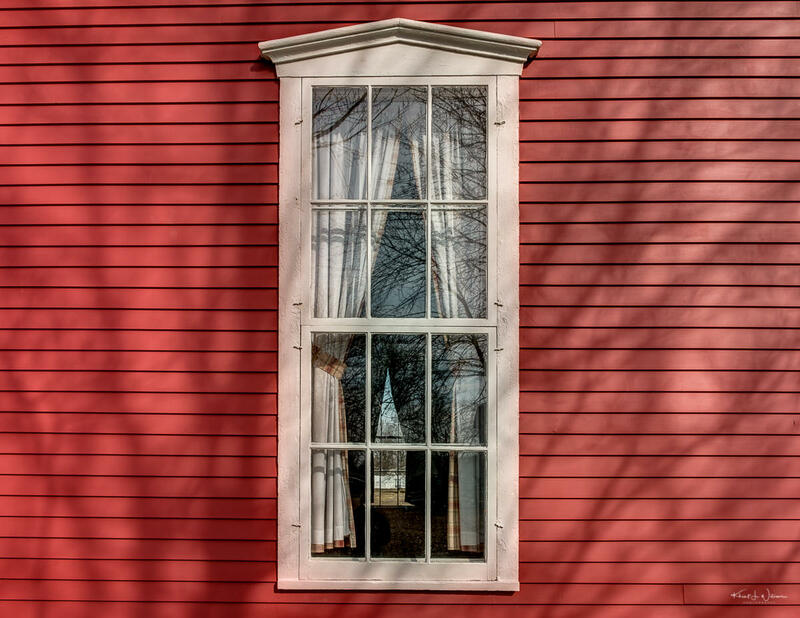 The longer side walls featured multiple double-sash windows, and the classrooms offered high ceilings. Up until shortly after the Civil War, their style and manner of construction mirrored churches and meetinghouses. Students faced a windowless wall at the back. The school also incorporated a raised platform at one end for when the classroom was used for assemblies. The South Branch School House was one of the first in the area built expressly as a tuition-free public school following the New Jersey Free School Act of 1871. With a room size of about 24 or 25 feet square the school was designed to accommodate 50 students. Every school should be well furnished. Everything added to make the schoolroom comfortable, convenient, and attractive, facilitates the work of education. A teacher cannot be expected to do good work without the proper tools. The desks furnished the children should be of the most approved style; they should have folding seats, so as to allow of freedom of motion in marching, callisthenics, and general exercises. Settees placed in front of the teacher’s desk are convenient for recitation purposes. The teacher’s desk should be neat and substantial, having at least six drawers in it. There should be three or four chairs, a thermometer, an eight-day clock, a small globe, a call bell, and other conveniences for teaching. Peak attendance at the school hit 95 in 1875. 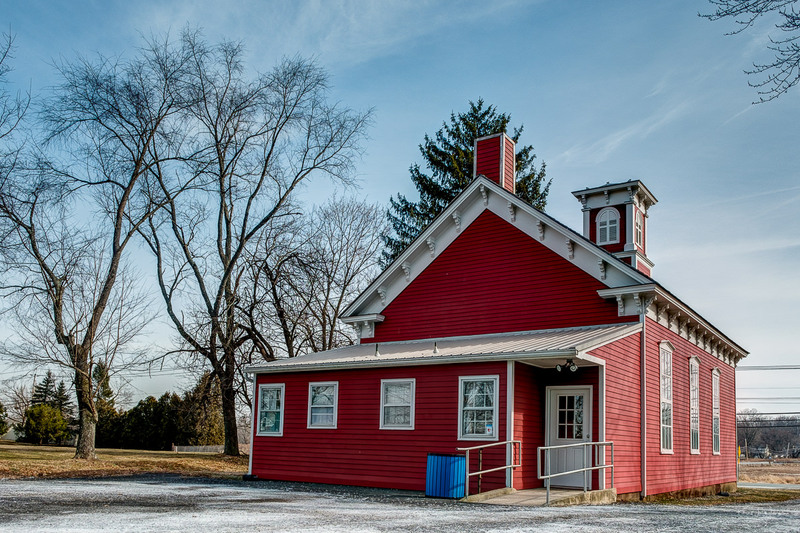 Due to declining enrollment, in 1950 Branchburg Township built a new built a consolidated elementary school and use of the Little Red School House dropped even further. In 1963, the Branchburg Board of Education sold the schoolhouse to Branchburg Township, and work was begun on a restoration project to coincide with the township’s tercentenary. Closing in 1965, the South Branch Schoolhouse was the last one-room school in use in Somerset County. Restoration worked continued into 2005, when the school was placed on the state and national registers of historic places. The famous opera singer, Anna Case, attended the school in the late 1890s. I shot from a tripod and bracketed my shots. The Classic Chome Fujifilm Film Simulation preset was applied to each image and the images combined in Photomatix Pro. The Natural filter was applied in Photomatix Pro and the resulting image was imported back into Adobe Lightroom for further adjustment.